Major League Baseball parks are made for distractions. Between the stall tactics of pitchers and hitters, the built-in breaks every inning, and the slow walk of a manager making a move, it’s enough to make the most loyal fan’s attention wander. Fortunately, a modern day at the ballpark provides more distractions than peanuts and Cracker Jacks. Celebrity sightings and wild promotions assault a fan’s senses during every break leading up a game’s seventh-inning stretch. Then there are the mascots that populate the home stadiums of all but four baseball teams. The fact that three are among the oldest teams (Cubs, Dodgers, Yankees) should explain the peripheral role a mascot can take with respect to an MLB club. Still, there are several mascots that have built loyal fan bases and come to represent both annoyance and distraction for visiting players. Here are six mascots known for provoking the ire of visiting teams and their fans. Players visiting Milwaukee have come to associate Bernie Brewer with the worst moments they spend in town. 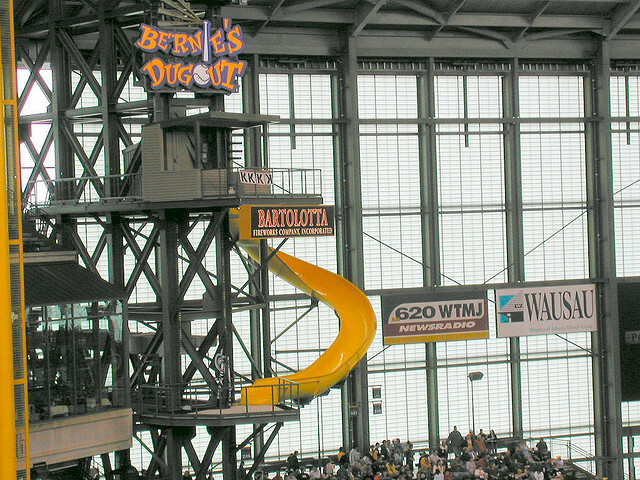 Any time the Brewers crack a home run or register a win, the mustachioed man careens down an enormous slide from “Bernie’s Dugout” in center field. Before Miller Park existed, Bernie had his own chalet with an enormous beer stein to soak up suds from the “Go Brewers” keg. The chief complaint about Bernie these days is his relevance in light of the sausage races drawing so much attention at Brewers home games. Still, the Brewers mascot has been a team fixture since 1973, making him one of the most storied mascots in the game. 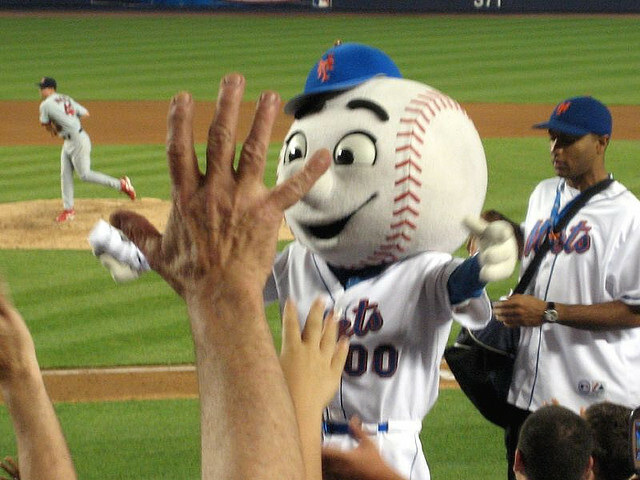 Any fans visiting Citi Field or, previously, Shea Stadium to see a team visit the Mets has probably had a run-in with Mr. Met. This mascot, whose head is an enormous baseball with a face on it, has a history dating back to 1963. He’s arguably the oldest and certainly one of the most mild-mannered mascots in baseball. That may be the personality trait of Mr. Met that irks fans who don’t want to see his face. He’s the nice guy so you feel bad about directing anger his way. The Cardinals’ Fredbird may be one of the least imaginative mascots in the business, but most complaints center around his propensity for “beaking” fans in the stands. Visiting players may balk at his otherwise penchant for gentility, something he shares with St. Louis fans who are known for being the classiest in the game. In recent years, Fredbird has drawn a bit of hate (many would call it envy) for his proximity to the gaggle of young ladies who make up Team Fredbird. This crew helps Fredbird in his nightly distribution of promotions and other sundry mascot affairs. Fredbird detractors ought to remember the man is simply doing his job. His insistence on spelling his name with a “ph” rather than “f” might be irritating, but there’s definitely more love than hate for the Philly Phanatic. In fact, he usually wins the popularity contest among mascots, attributable to his flair for physical comedy and antics on a three-wheeler. The Phanatic has called Philadelphia’s Veteran’s Stadium and Citizen Bank Park home since 1978. That makes the chunky green fellow a witness to the Phillies’ first World Series win in 1980. Since his salad days, the Phanatic has gotten the goat of characters from every visiting ball club. He’s so much fun to watch that even opposing teams tend to enjoy his antics. However, there is still the occassional time the Phanatic will be able to push the buttons of a holdout. His lampooning of the Brewers’ hot dog race during Milwaukee visits to Philadelphia is a must on the Phanatic highlight reel. Known for snatching cotton candy and popcorn from fans, Kansas City’s Sluggerrr has made a few enemies in his day. 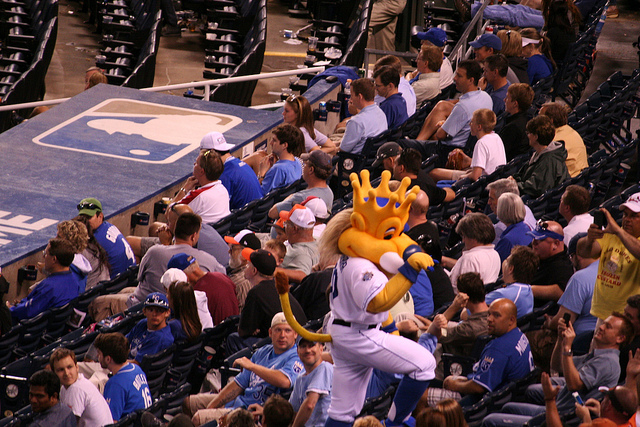 What redeems the ball player with the lion’s head (crown attached) is the fact he’ll toss t-shirts and hot dogs into the crowd during a typical game at Kaufman Stadium. Since debuting as the Royals mascot in 1996, the 7-footer has bothered several opposing teams yet not seen his preferred club head to the postseason. In 2014, he may get the call. 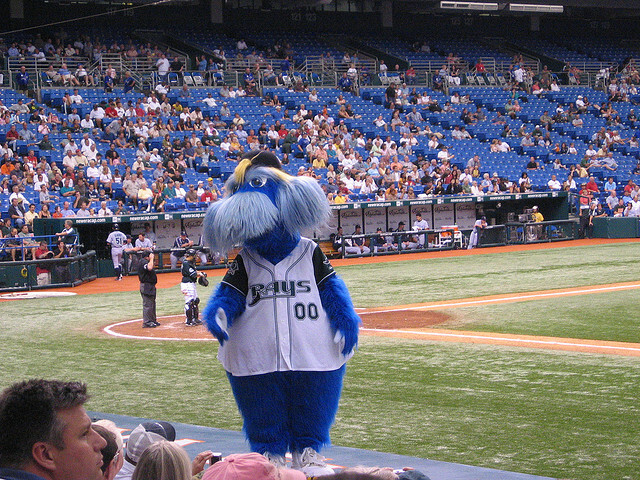 This natty, hairy creature that reportedly hails from the deep blue sea can be seen wreaking havoc in the stands daily at Tropicana Field. To a youngster not prepared for such a sight, Tampa Bay’s Raymond may cause a few sleepless nights. Raymond’s MLB.com profile page seeks to dispel any negative associations the creature might engender. Raymond Ray is said to hail from the Gulf of Mexico, though the exact date of his birth is unknown. He made his MLB debut in June 1998. Later, he was identified as a “Seadog,” which makes him a cross between a sea lion and a domesticated dog. Raymond’s species, known as “Canus Manta Whatthefluffalus,” allows him to transcend the normal restrictions of sea creatures and enjoy spending his time with children (fetching sticks, etc.). At an often noisy Tropicana Field, he probably represents a vicious fiend to visiting teams on the losing end of a contest.